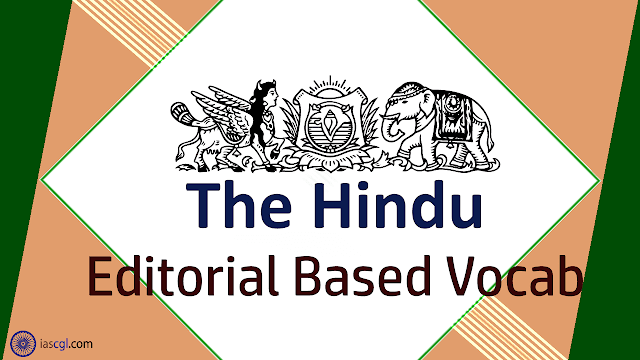 HomeVocabThe Hindu Vocab 07th September 2018 For Competitive Exams. The Hindu Vocab 07th September 2018 For Competitive Exams. Vocabulary from The Hindu Editorial 07th September 2018 for Staff Selection Commission(SSC) Combined Graduate Level, Combined Higher Secondary Level, Bank PO, Clerk and other state Government Examination. Elimination, which means reducing the number to one case per million people per year, will be impossible without universal, equitable access to affordable, quality TB diagnostics and treatment for anyone who needs it. Much to the disappointment of global civil society, issues around access to diagnostics and drugs have been considerably diluted in the most recent draft of the Political Declaration. A critical omission is that countries may avail of the various flexibilities under the Trade-Related Aspects of Intellectual Property Rights; another is that countries may invoke the Doha Declaration to compulsorily license drugs for use in public health emergencies. Yet another is the option to de-link the pricing of new TB drugs from the costs incurred in their research and development. The latest draft is a watered-down version of the original that actively committed to upholding access to affordable generics for all. TB is, by and large, easily diagnosable and curable. It is unacceptable that it nevertheless remains the leading causes of death from any single infectious agent worldwide. Each day, thousands of people with TB die, often because of inequitable access to quality diagnosis and treatment. In addition, the rapid emergence of drug-resistant forms of TB (DR-TB) in many countries brings a fresh set of needs including new and comprehensive diagnostic tests and second-line TB drugs, and health systems trained anew to manage DR-TB. India not only accounts for a fifth of the world’s TB burden, it also has the largest number of people living with multidrug-resistant TB. In March, Prime Minister Narendra Modi said India would eliminate TB by 2025, ahead of the global targets. These targets cannot be achieved without access to affordable, quality diagnostics/ drugs. Unless India assumes a leadership role to restore every possible option to protect universal access to TB drugs in the Political Declaration, 2018 may end up being just another brick in the wall. Battling: जूझ -fight or struggle tenaciously to achieve or resist something. Scourge: चाबुक से पीटना - causing disruption or annoyance through being unwelcome or uninvited. Gravitas: (किसी ख़ास अंदाज़ में)कहना - a whip used as an instrument of punishment. De-link: लिंक हटा देना -break the connection between (something) and something else. Incurred: किए गए - become subject to (something unwelcome or unpleasant) as a result of one's own behavior or actions. Galvanise: प्रेरित करना - shock or excite (someone), typically into taking action. Infectious: संक्रामक -likely to be transmitted to people, organisms, etc., through the environment. If you think, we missed important word/s from this article. Please comment below.